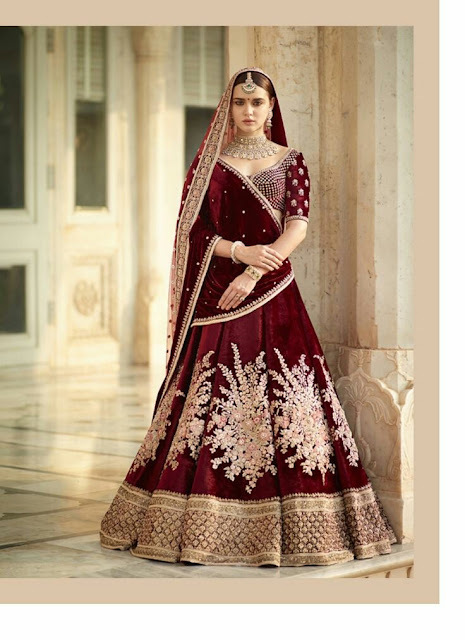 Wedding is an important event in every girls life and she wants to look her ethnic best on her special day. 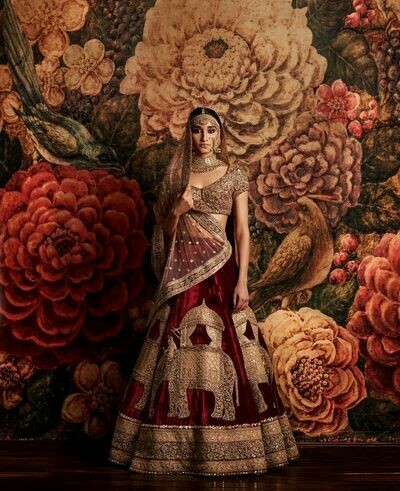 The ultimate dream of every Indian bride-to-be is to be dressed in a Sabyasachi Mukherjee creation. This ace designer combines old world charms, traditions and a certain sort of elegance and sophistication in his bridal wear making him a huge hit with contemporary brides. 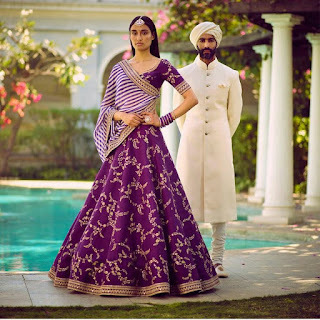 Sabyasachi is a favorite even with Indian celebrity brides. 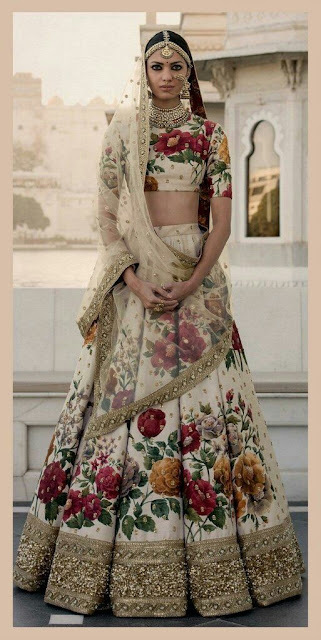 Bollywood actress Anushka Sharma also chose this designer for her Tuscan wedding to Virat Kohli. 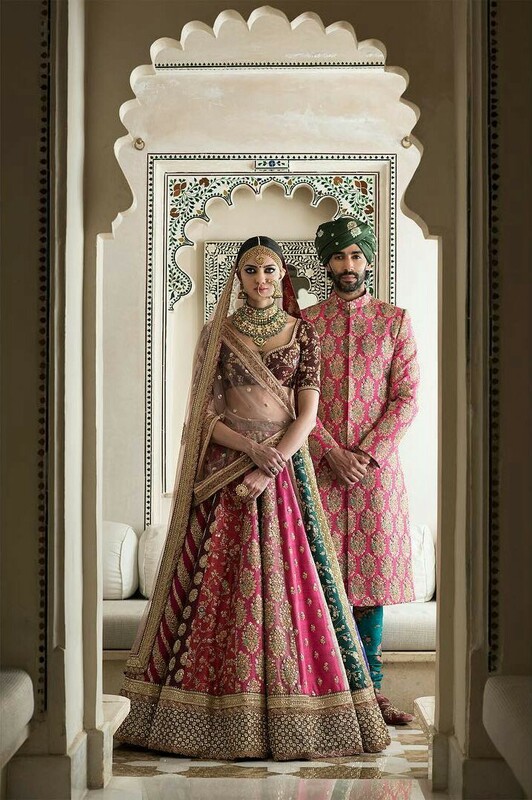 Other notable celebrity brides who wore Sabyasachi creations on their big day include Soha ali Khan, Asin, Bipasha Basu, Amala paul and Amrita Puri. 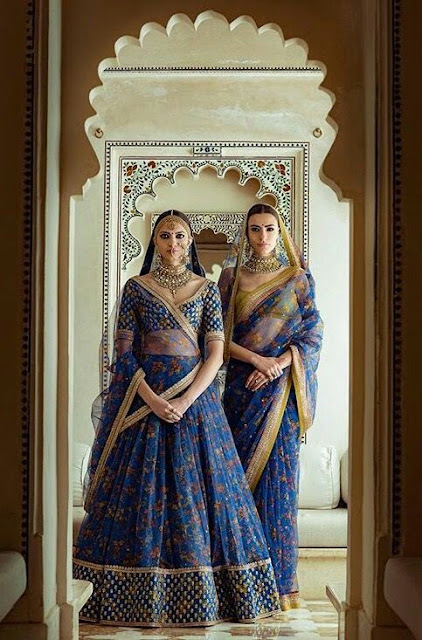 If you are one of those soon to be brides who is in love with the craftsmanship of Sabyasachi mukherjee, then I bring to you a collection of breathtaking Sabyasachi lehengas, jaw dropping bridal inspiration right here in this post. 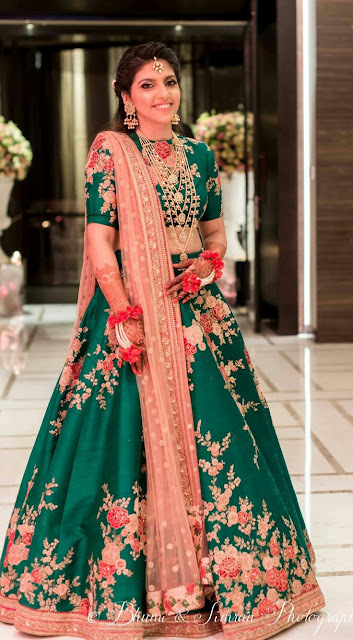 Soha Ali khan's Gold and orange combination for her regal wedding was both elegant and classy. 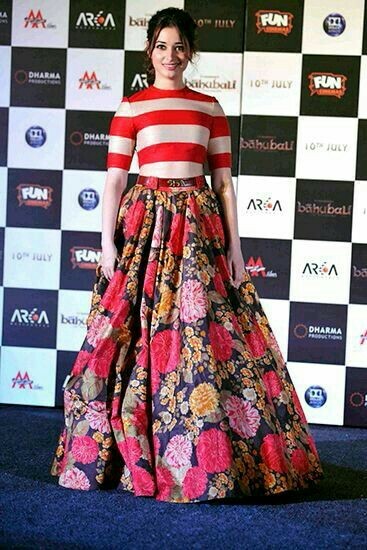 For me, Soha ranked right on top of the best celebrity brides until Anushka sharmas pastel dream happened. 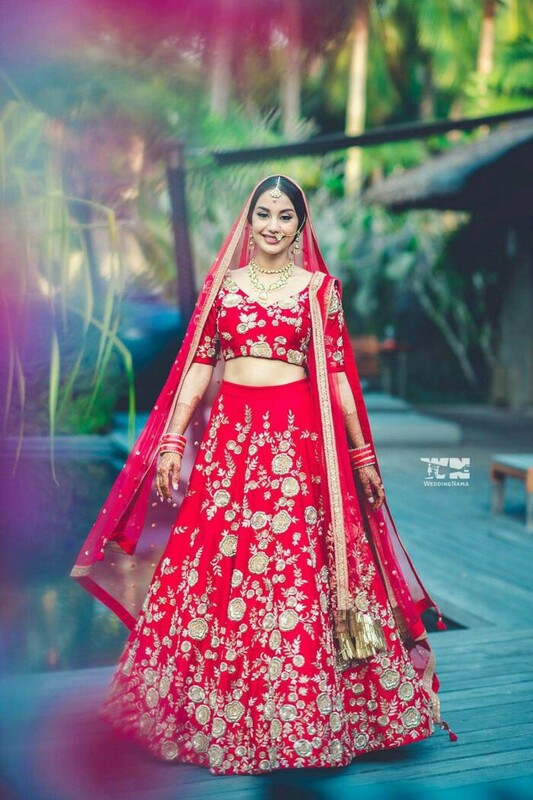 In this gorgeous gold Sabyasachi lehenga Soha made for a radiant bride without going overboard on bling. 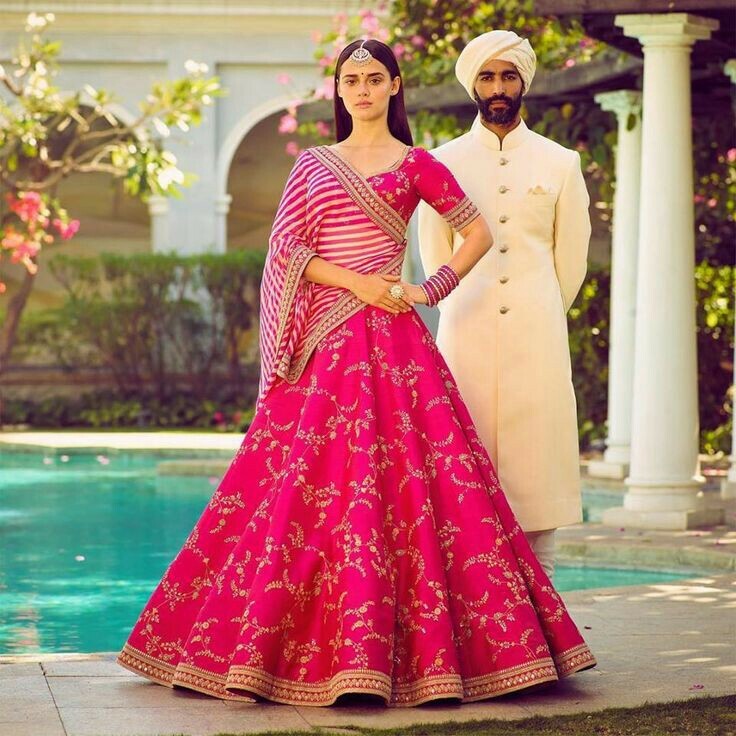 If you want something royal then this is the colour combination to try. 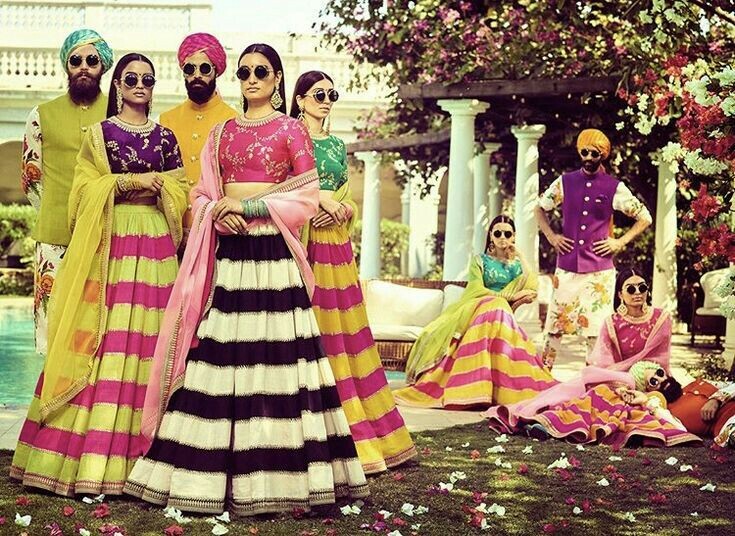 The latest collection of Sabyasachi has lehengas in summery vibrant neon hues are perfect for destination weddings. 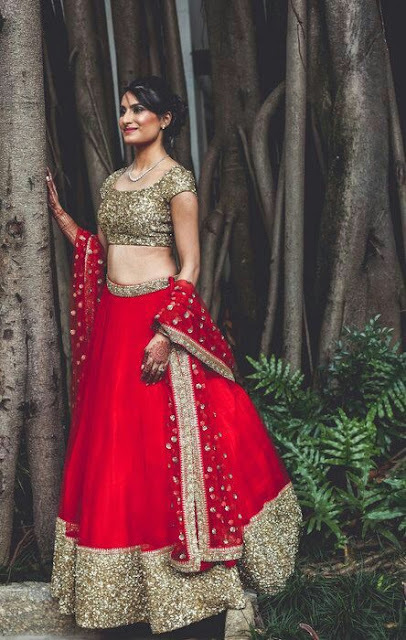 These lehengas are light so they can make for stunning statement sangeet outfits too. An emerald green floral printed sabyasachi lehenga which this real bride wore is so unique and hatke. 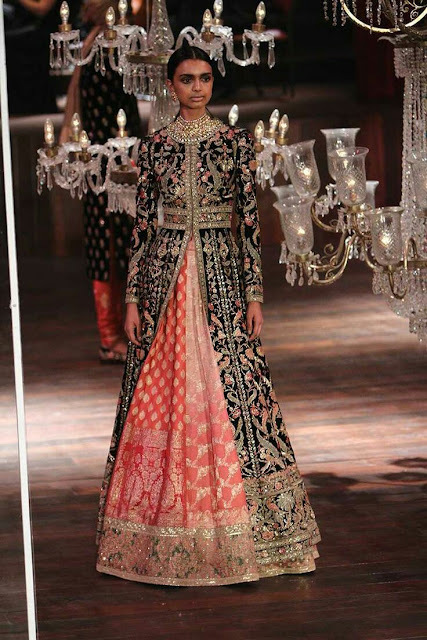 The contrasting dupatta plays down the print and brings necessary bling to a bridal outfit. You can wear this for mehndi, sangeet or even your wedding with styling tweaks. Red is the preferred colour for Indian brides and sabyasachi has a great collection red lehengas. This bridal lehenga is your traditional stuff with a bit of modernity brought in by florla patterns. 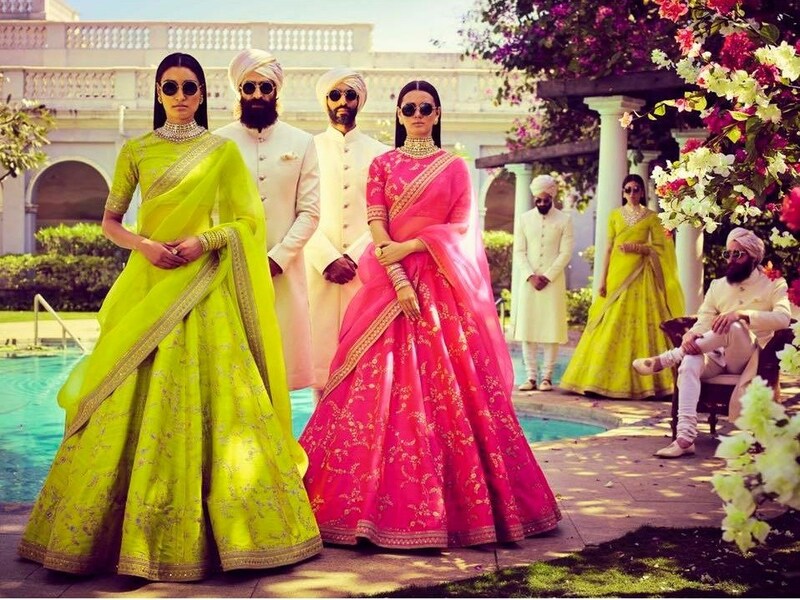 When photos of Anushka Sharmas tuscan wedding surfaced I stared in awe at the exquisite outfits and fresh colour pallet. 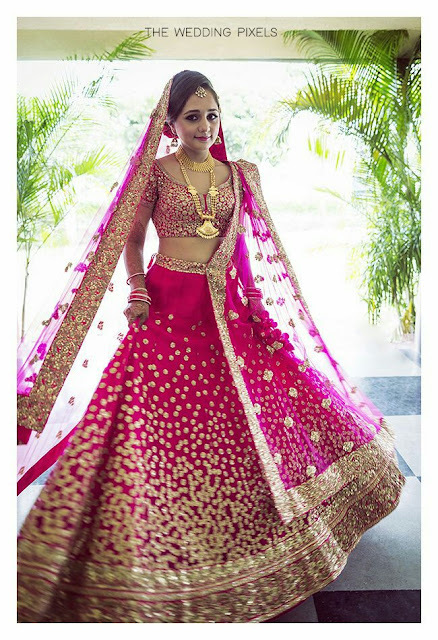 This Pastel floral lehenga made Anushka Sharma look angelic bride and will sure inspire many brides in future. If you are going for a fairy tale romantic themed wedding try something like this. 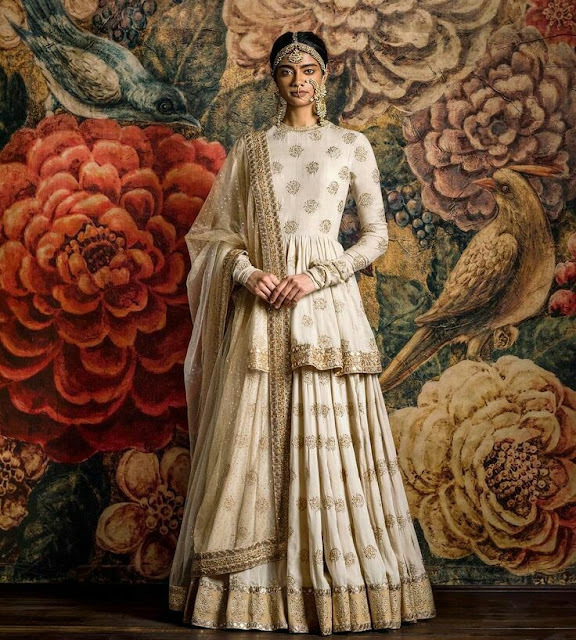 A vintage gold sequined Sabyasachi lehenga with a belted dupatta is what Anushka Sharma wore for her mumbai reception. 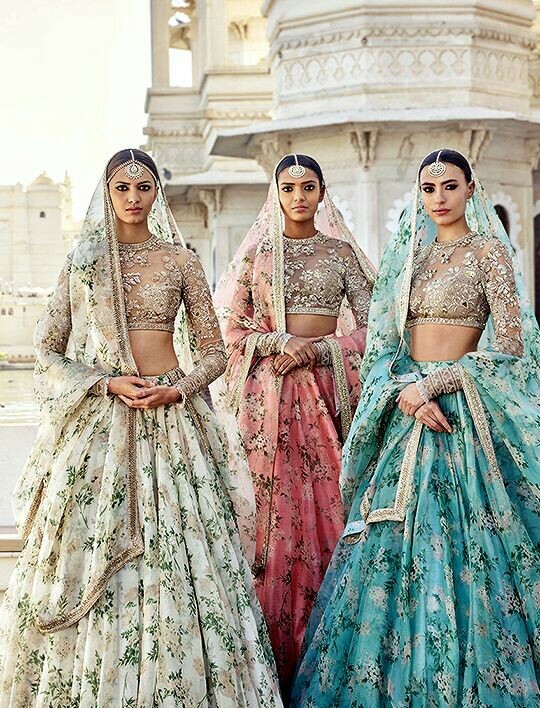 If you want something traditonal with a contemporary touch indulge in lehengas with unique hues and go for modern dupatta drapes. 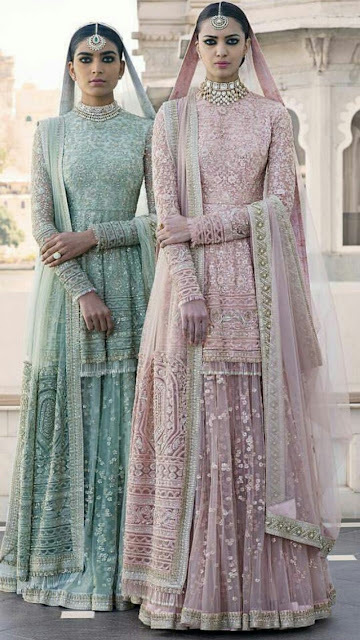 Summer wedding? 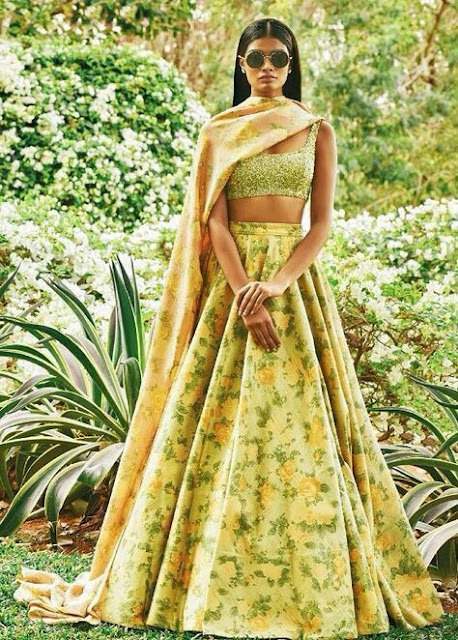 Floral are your best bet. White and black with a blend of vintage floral makes this a unique and fresh sabyasachi lehenga to carry off. 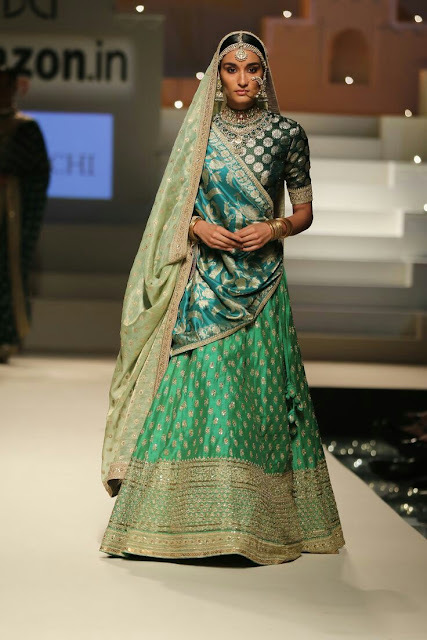 Green makes for a regal colour and when paired with gold bling it is enough to make the bride stand out. This Sabyasachi Mukherjee creation is just the right shade of green with the offbeat embroidered pattern giving the outfit a bit of zing. Paired with deep cut choli and sheer cream dupatta this makes for a striking bridal sayasachi lehenga. 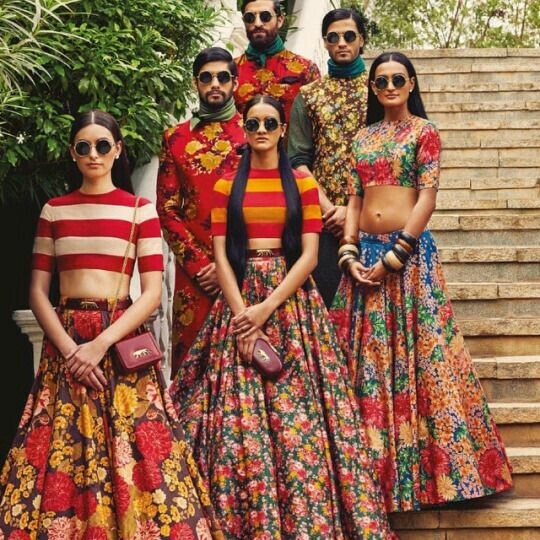 Printed lehengas are a rage these days and Sabyasachi mkherjee sure popularized it with is 2015 spring summer collection. 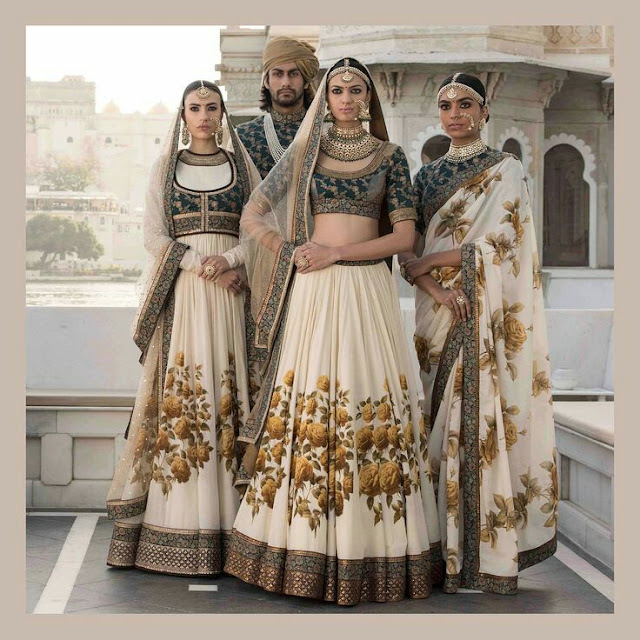 Here in his latest collection too Sabyasachi has some gorgeous light weight lehengas for the bride who wants to have fun and not get weight down by her outfits. 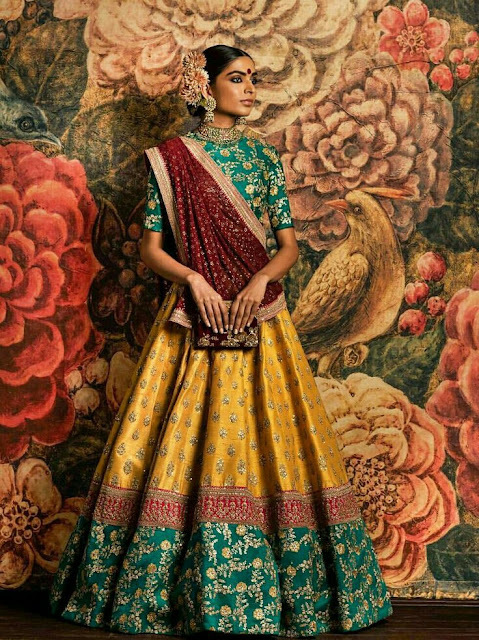 This yellow printed lehenga is perfect for mehndi in a destination wedding. A refreshing new touch to monotone Sabyasachi lehengas, this season the designer added striped aka leheriya dupattas to his bridal lehengas. 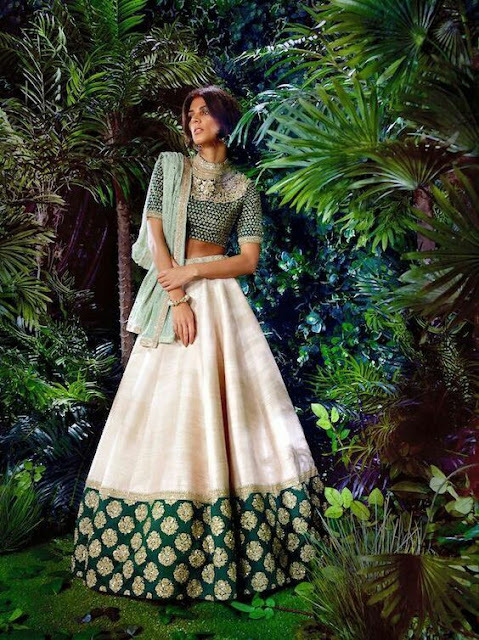 These monotone lehengas come in various shades.